The supercar is heading to auction as part of the Barrett-Jackson Las Vegas sale later this month. Just 918 units of the Porsche 918 hybrid hypercar were built between 2013 and 2015, each one at a cost of around $847,000. But of the nearly 1,000 examples built, none are as unique as the example pictured here. This is the only Porsche 918 finished in VooDoo Blue directly from the factory – and it’s heading to auction in just a few weeks. As part of the Barrett-Jackson Las Vegas sale, alongside a handsome Shelby GT500 Super Snake, and a desirable Clarion Builds Acura NSX, this one-of-a-kind Porsche will cross the auction block. Though Barrett-Jackson doesn’t list a price, given its rarity, it should go for well over seven figures. Apart from the one-off VooDoo Blue finish, it also comes with an appropriate Martini livery, handsome silver wheels, and a gloss black rear wing. But don’t let its custom finish fool you, number 184 of 918 built, this 918 comes with the same 4.6-liter hybrid V8 producing 887 horsepower (661 kilowatts) found on all models prior. That powertrain allows for a 0-60 mile-per-hour (96 kilometer-per-hour) sprint of just 2.5 seconds, on to a top speed of 217 mph (349 kmh). It’s driven less than 1,200 original miles (1,931 kilometers) since new, and comes paired to an advanced four-wheel-drive system. The cabin, though not as colorful as the exterior, is covered in a number of unique fitments, including carbon fiber controls, door panels, and a removable roof. The seats, dash, and steering wheel are finished in a subtle black leather with white accent stitching throughout. Previous examples of the 918 regularly sell at auction for over $1.8 million, so expect a rare example such as this to go for even more. The Barrett-Jackson Las Vegas sale will kick off on October 19, 2017, as the Mandalay Bay Resort. 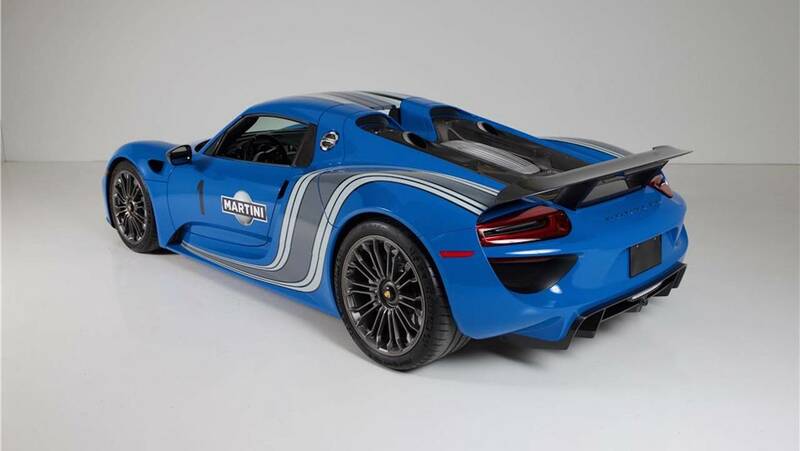 This 918 Hybrid Hyper Exotic is not finished in Porsche's standard Mexico Blue. It's the only 918 Spyder in the world painted to code from Porsche Germany in breathtaking Voodoo Blue, with an authentication letter to prove it. Under the hood, it's equipped with a 4.6-liter V8 mated to an automatic transmission. With its hybrid but separate electric motor, it produces 887hp. This 918 goes from 0 to 65 in 2.5 seconds and has a top speed of 217 mph. There are less than 1,200 miles on the odometer of this 4-wheel-drive masterpiece, and it's the only hyper-exotic with 4-wheel steering. Inside the cockpit, this car is loaded with Porsche touches, controls and carbon-fiber panels, including a removable roof that stores in the front trunk. And should it run out of gas, the car gets a full 18 miles on electric power alone. (The longest of any hyper-exotic.) Porsche fans from all over the world have flown into Austin, Texas, to see this car, where its spent the last two years on display at the Rock and Roll Car Museum - not only because it's #184 of the total 918 Spyders produced, but it's the only one in the world painted to code in Voodoo Blue at Porsche. To make this car even more special and give the owner a special Porsche finishing touch, the car's ignition key even comes in matching Voodoo Blue.